Summary: Big news, Nbeads.com is waging the “Submit Articles, Earn Cash” activity. It is an easy and direct way to make money. 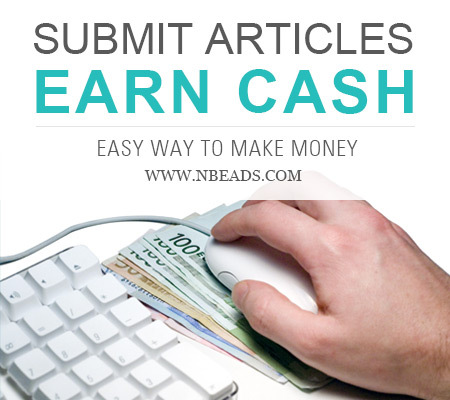 Big news, Nbeads.com is waging the “Submit Articles, Earn Cash” activity. It is an easy and direct way to make money. Submit: We offer articles, the only thing need you to do is submitting them to your blogs, sites or any other content healthy online platforms. Cash: $8/10articles is the average price. The smallest unit is 10 articles. The more you submit, the more you earn. Cash will be paid by PayPal. 1. The PR (page rank) of the blog, site or platform’s homepage should be equal or larger than 1. 2. Blogs, sites or other platforms should be active, in other words, at least be updated once in 1 month. 4. The site or platform should be related with our topic about beads fashion or jewelry making; the field such as fashion, DIY crafts, gifts ideas etc. will be more suitable and welcome. After submitting, please take down article page URL; provide the URL list and your PayPal address to us. We will check it, if nothing wrong; we will pay cash to your PayPal. If you have any other question, please feel free to contact us. Mail: [email protected] . (Btw, we would be appreciated if your mail title is “submit articles, earn cash”) We will reply to you quickly. Welcome to cooperate with us, we are looking forward to your message.